Cambridge and Peterborough Clinical Commissioning Group (CCG) has put together a comprehensive list of organisations we can turn to for support. Many children and young people are affected by poor mental health that can significantly impact upon their lives. With half of all lifetime mental health problems emerging by the age of 14, ensuring that children and young people have the right support early on is vital. Locally, there is a range of work underway to improve mental health support for children, young people, parents/carers and professionals. www.keep-your-head.com A new young people’s mental health website for young people, parents/carers, GPs and other professionals. It is a central point for good quality information on keeping well, self-help and support services. The website covers a range of issues including stress, bullying, selfharm and what to do in a mental health crisis. www.kooth.com This free online counselling service provides information and support for people aged between 11 and 24 years. Young people can book counselling as regular structured sessions with an assigned counsellor, or use the ‘drop in service’ online and have a text based conversation with a trained counsellor. This service is available 12.00 noon – 10.00 pm Monday-Friday and 6.00 pm – 10.00 pm on weekends, 365 days a year. Cambridge and Peterborough Foundation Trust (CPFT): provide a self-referral service, known as Improving Access of Psychological Therapies (IAPT). 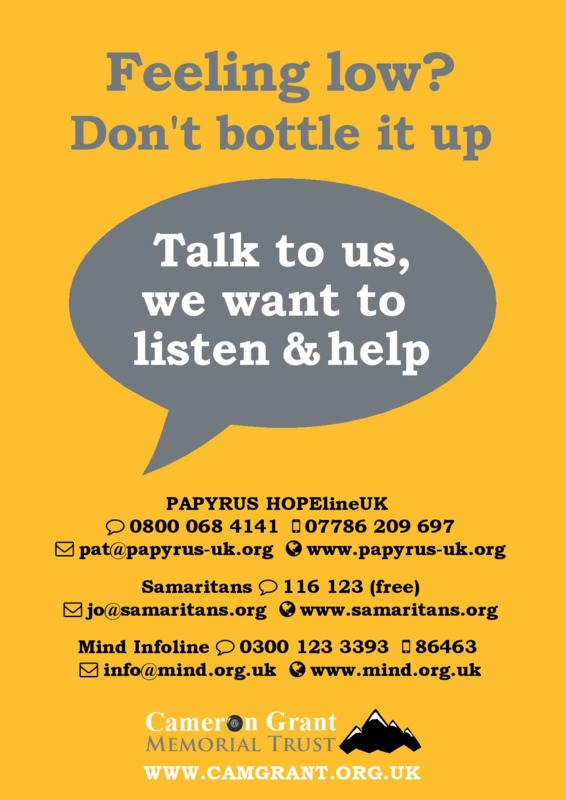 They can help support you if you are feeling low, stressed, anxious, worried or burnt out. You can either discuss accessing their support with your GP or you can self-refer. To self-refer, telephone: 0300 300 0055 or visit www.cpft.nhs.uk. They work with partner agencies, including MIND, Lawrence Way Counselling, Group Therapy Centre, Insight Healthcare and more. We hope this information is helpful to children, young people and families. If you would like further information, please ask at Reception or your GP. Copies are available in Reception. Please help yourself to supplies of the Cameron Grant Memorial coaster.